Akagi a 34,364 ton aircraft carrier, was built in Kure Japan. It began as a battle cruiser. 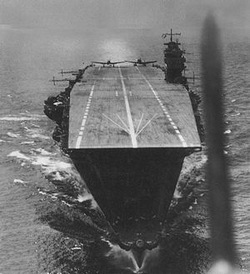 The ship was one of Japan's large aircraft carriers in March 1927. The ship was reconstructed in 1935 and ccompleted in 1938 and was flagship for the Pearl Harbor Attack in December 1941. The ship took part in carrier raids in the Indian Ocean area and was flagship of the carrier striking force during the Battle of Midway. On June 4 1942, while operating northward of Midway, Akagi was hit by dive bombers from USS Enterprise (Cv-5) set afire.